Q.1 A square and a rectangular field with measurements as given in the figure have the same perimeter. Which field has a larger area? Sol. Perimeter of a square = 4 x Side of the square = 4 x 60 m = 240 m.
Area of square = (side)2 = (60 m)2 = 3600 m2. Area of rectangle = length x breadth = (80 x 40) = 3200 m2. Hence, the area of the square field is larger. Q.2 Mrs. Kaushik has a square plot with the measurement as shown in the figure. She wants to construct a house in the middle of the plot. A garden is developed around the house. Find the total cost of developing a garden around the house at the rate of Rs 55 per m2. Sol. Area of the square plot = (side)2 = (25 m)2 = 625 m2. Area of the house = length x breadth = (15 m x 20 m) = 300 m2. Given, the cost of developing the garden around the house is Rs 55 per m2. Therefore, cost of developing the garden of area 325 m2 = Rs (55 x 325) = Rs 17,875. Q.3 The shape of a garden is rectangular in the middle and semi circular at the ends as shown in the diagram. 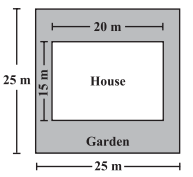 Find the area and the perimeter of this garden [Length of rectangle is 20 – (3.5 + 3.5) metres]. Sol. Here, diameter of semi - circle = 7 m.
Hence, the area and perimeter of garden are 129.5 m2 and 48 m respectively. Q.4 A flooring tile has the shape of a parallelogram whose base is 24 cm and the corresponding height is 10 cm. How many such tiles are required to cover a floor of area 1080 m2? (If required you can split the tiles in whatever way you want to fill up the corners). Thus, 45000 tiles are required to cover the floor. Q.5 An ant is moving around a few food pieces of different shapes scattered on the floor. For which food-piece would the ant have to take a longer round? Remember, circumference of a circle can be obtained by using the expression c = 2πr, where r is the radius of the circle. Sol. Here, the figure for which the perimeter will be maximum will be the one for which ant will take longer round. So, let us find the perimeter for each figure. a) From the figure, diameter = 2.8 cm. Therefore, radius = 2.8 / 2 = 1.4 cm. Hence, for the figure (b), the ant will have to take a longer round.